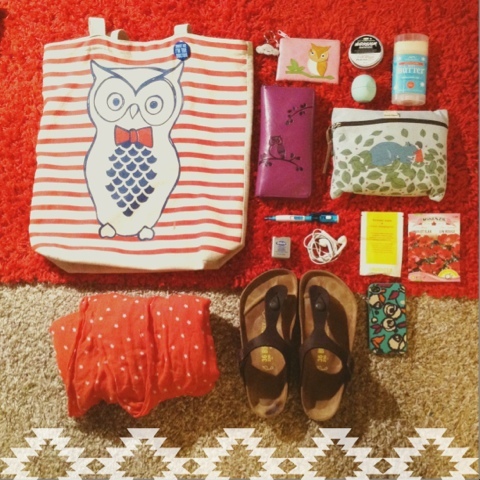 I found this owl bag at Old Navy a bit ago and get so many compliments on it. My favorite is to tell the hipster people where I get it from and watch their world view change. Also shown is my owl change purse, owl wallet and gorgeous little blue bag full of odds and ends I don't want loose in my purse. Body butter from Rocky Mountain Soap, egg lip balm from Chapters and Ultrabakm from Lush. A pen that doubles as a flashlight (to shine in friends eyes obviously), floss (always handy) and headphones. Extra tea, poppy seeds and my Birkenstocks. Also my current favorite star scarf and my iPhone with its gorgeous case from Fossil. When I was taking this photo I was like: that's a lot of owls. I didn't even realize. Awkward. So I usually end up with a lot of stuff in my bag, and today was no exception. A complete silverware set (didn't realize that was in there! ), my awesome pocket knife, a flash drive, sunglasses and my reusable bag from Bulk Barn (got it free for a big purchase). Next: four kinds of lip balm and a hand cream. Odd. I never wear lip balm. 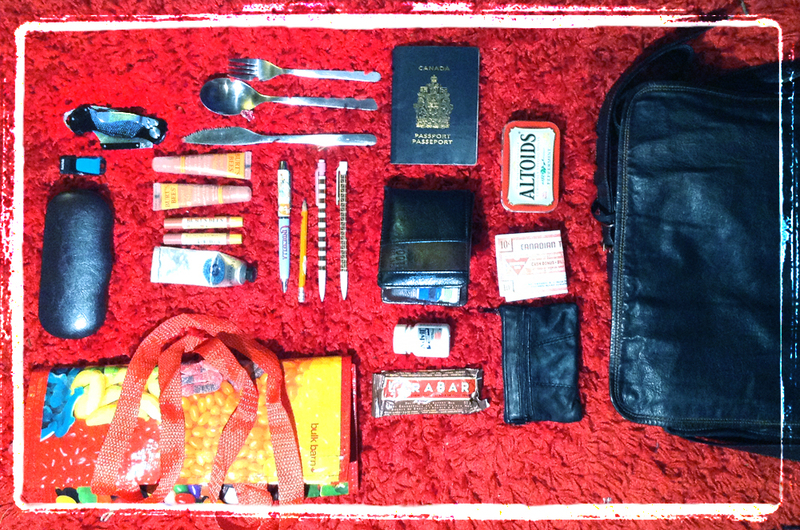 Some writing utensils, passport, wallet, advil and an emergency protein bar. Altoids (curiously strong...), Canadian Tire money (patriotic me!!) and a change purse. 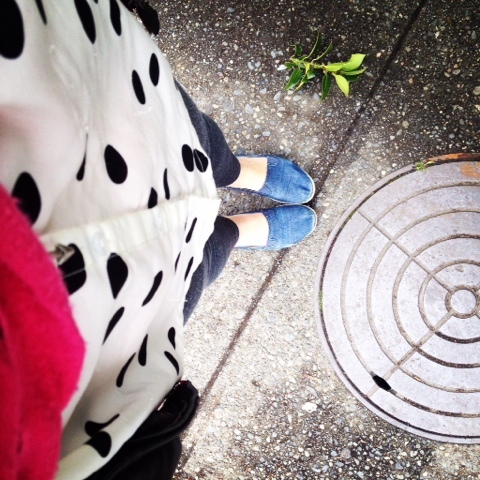 I jangle a bit when I walk. 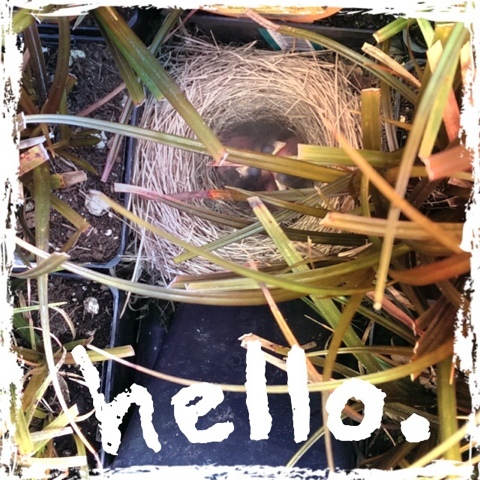 Roots and Leaves - the eggs hatched! Remember last week when I was talking about the amazing nursery I went to and I saw those gorgeous four perfect eggs? Well guess what? The eggs hatched, as eggs are want to do. I haven't seen the hatchlings yet but my dad sent me these photos. Life sure is amazing, is it not? Hello new life. 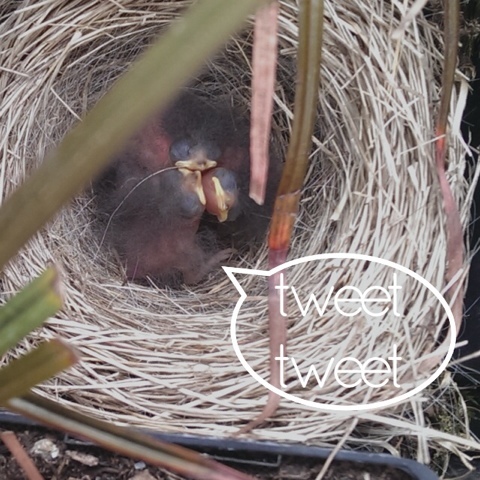 Hello new birds. 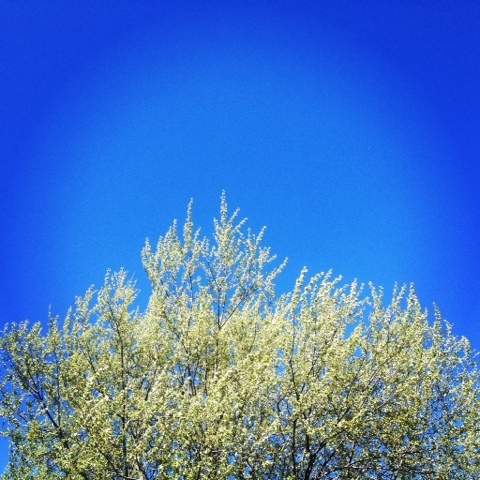 Hello spring! One of the kids at work drew this in sidewalk chalk and I thought it was just great! Big fan of mermaids, and possibly planning a mermaid project for the summer. More on that later! However, I remember spending a lot of time with chalk out in the driveway. Sometimes I would cover the entire driveway with a chalk mural. Unfortunately the chalk colors were never that saturated, and it was hard to tell them apart, which meant that it was hard to tell what I was drawing. Probably better options out there these days. Spring bouquet! It's that time of year when all the shops and people are celebrating the wide variety of flowers now available!! These are part of a bouquet my sis and I brought over to our parents for Easter Dinner. You will for sure see more floral in the future here. What I've been working on this week (and last week). Part of the elephant series I'm doing, this one is charcoal and cold wax on vellum. Basically the cold wax turns the charcoal into a painting medium, and the smooth surface of the vellum helps it slide. You can get fantastic brush strokes. As well, the wax can be scratched away from the surface, resulting in super sharp lines. I'm going to do a Steller piece on it soon. This week. Man, it was a good one. Four days since Monday was a stat and we had our Easter dinner with our folks and brother. That's always a good time. A loud time too, but good. This week I went with some of the children at work to the local petting zoo and it was hilarious that one of my little three year olds was terrified of peacocks. True-they were bigger than her, but I've never seen a fear of birds like that before. 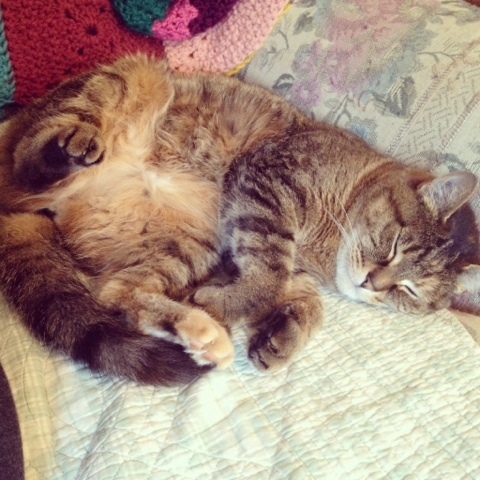 My cat continues to do cute things (and non cute things like when she wakes me up at four o'clock to go out). The flowers here are blooming and I know we're so lucky because so e of the country is under snow but we have lilacs. 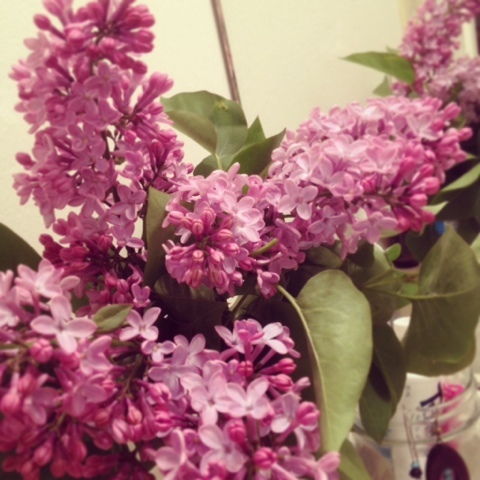 I liberated these from a fence as I was walking back from my sisters and they're living in my bathroom, giving me a delightful smell every time I walk in. Today my plan is to finish my book, catch up on some tv and maybe craft a little. What are your plans for the day? My African Violets are loving their spot in the sun, right by the balcony door. 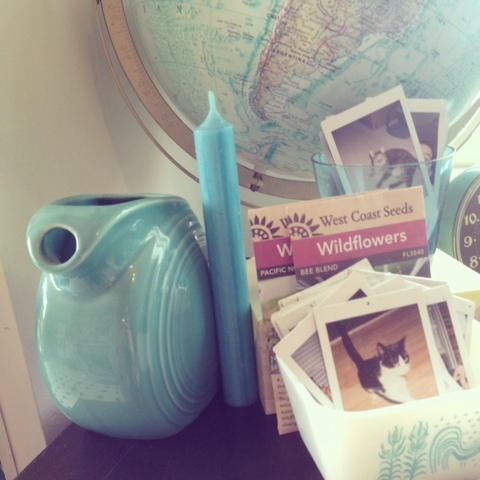 The robins egg blue pots I got at the dollar store (yay!) 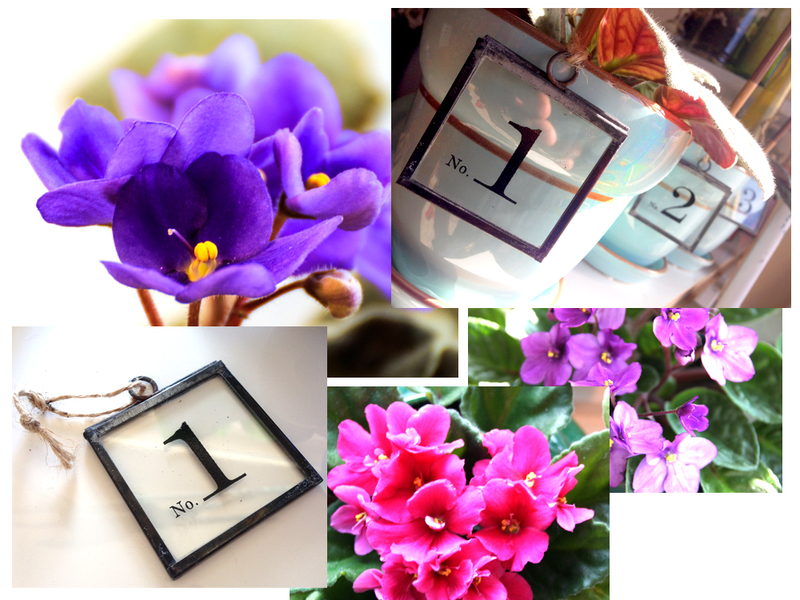 look fab, and to top it off I found these fantastic glass numbers yesterday! I stuck them in the soil using old chopsticks so they could hang down. Reminds me a bit of Dr. Seuss, thing1, thing2 and thing3. lol. If you have trouble caring for your African Violets or think they may be too hard to handle, it's not so! The Canadian Gardening site tells us that they like bright sun for most of the day, with full sun for a few hours in the afternoon. You can see the easy growing guide here. This vid was done quickly with my iphone, so no fancy bells or whistles (which is probably why the focus goes in and out a bit, lol) however I really enjoy the homey charm it gives off. Like a really old family video with bad color and lighting, but lots of love. 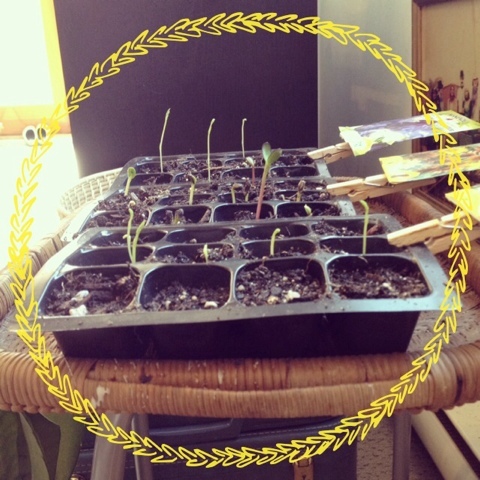 Roots & Leaves - My Lettuce Garden - Watch it grow! Basically this is how my garden works! The lettuce seeds took about a week to sprout, during which I wondered if I'd over watered them, or if it was too cold on my balcony. But then *boing* they popped up! Some nice sunshine and rain (they see rain and go *whoop whoop! *) and my lettuce was growing! I have two kinds in my planters, "City Garden Mix" (the *fluffy* one) and "Paris Island" (which is very french). There are so many different varieties of lettuce to grow, you could have a whole bunch of different kinds for super good looking salads. I think I'll add a few next year. I used my homegrown lettuce in a simple salad of apple, blue cheese, lettuce and dressing. Delish! Feel free to share your fav salad recipes!! When I'm contemplating decorating in my house, there are two things I seem to gratification towards. 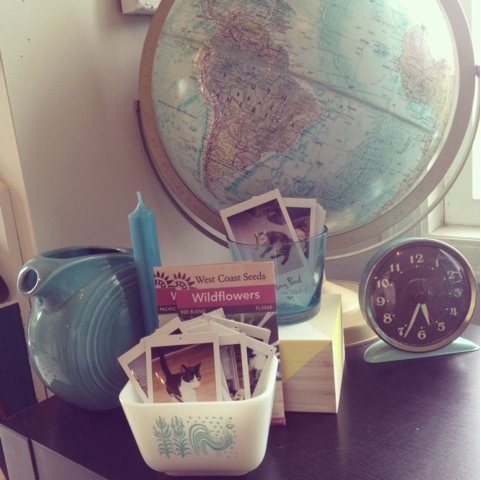 The color turquoise and small vignettes. If I can find a way to meld both things together than so much the better. When I was figuring out this corner of my living room, I knew I wanted to have some of my favorite items on the top of my bookcase as well as have it display some useful items. This can be a hard mix but the result is somewhere I love. - Figure out color: Do you want it to be of one similar color like I did or complementary colors? Is it themed (like jungle or cowboy) so that you can you can use colors within that theme? Are you going with a total mishmash or sticking with pastels or brights or red tones? I find color the easiest place to start since then you can build off that. If you're not sure about colors, collect some items you'd like to include and see if they are matching in some color way. -Gather items: When gathering items think about how you want the space used. Is it entirely for display? If so then maybe you don't care if the items are functional, you'd like things to look fun and pretty. 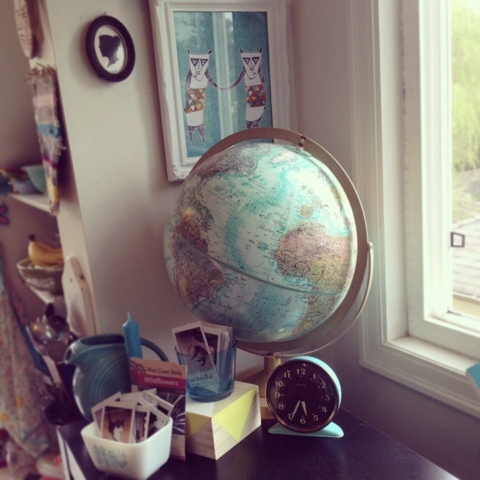 If it's functional then mix in a few fun items anyways like I did with the globe and clock. -Arrange and Don't forget ART: Take a few days to figure out the arrangement. Don't be afraid to scrap a certain item or move the items around. In small areas sometimes less is more but other times the overcdowded look is exactly what you're going for-you won't be able to know until you have the items together. Art is my favorite thing to put up and I am extremely blessed to have an artist for a sister. Most of the art in my house is from her. Art can match your color theme subtly and tie everything together. 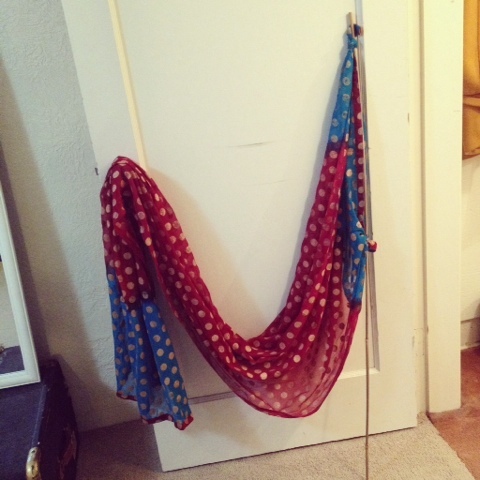 What little corners of your house are your favorite? Last fall on a very rainy wet day Crystal and I went to the Vancouver Art Gallery to check out the Kimsooja Unfolding exhibit. 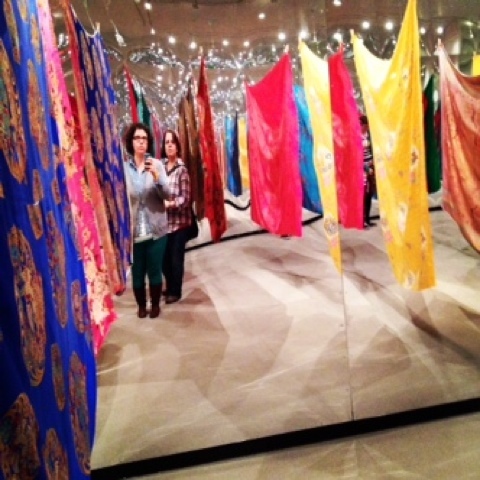 It was pretty amazing overall but the best part was the large room with gorgeous fabrics hanging. 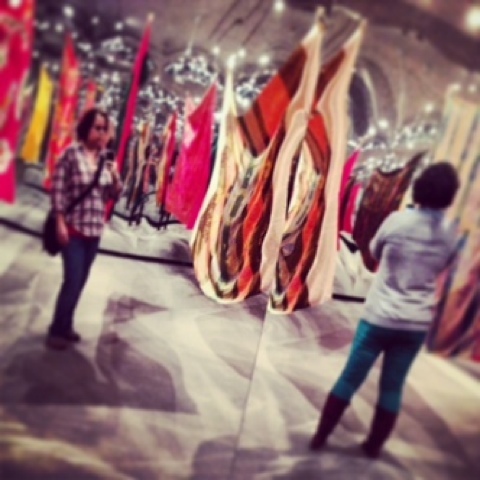 There were mirrors on the sides so that the room appeared even bigger and huge fans that made the fabric sway. The fabric was in rows so you could walk through it. My favorite parts were when you were in the middle and couldn't see the rest of the museum. 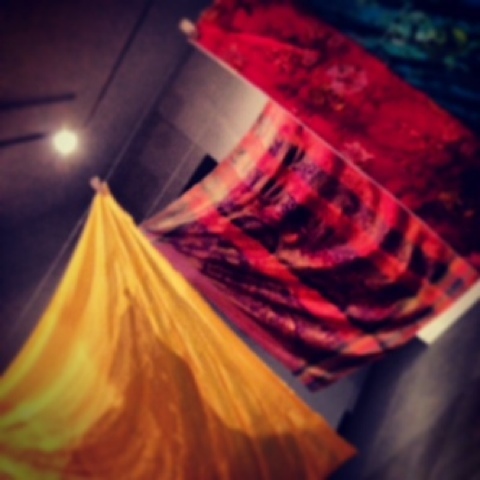 Surrounded by billowing patterned golden fabric was the coolest experience. The whole time Crystal and I were figuring out how to recreate this in our homes. First step is to find gorgeous draped fabric with patterns and gold. Second, hang it from the ceiling and then get some kind of fan. Third is I guess to enjoy. To be honest it's easier said than done to find the right kind of fabric. But possibly the hunt is part of the experience? 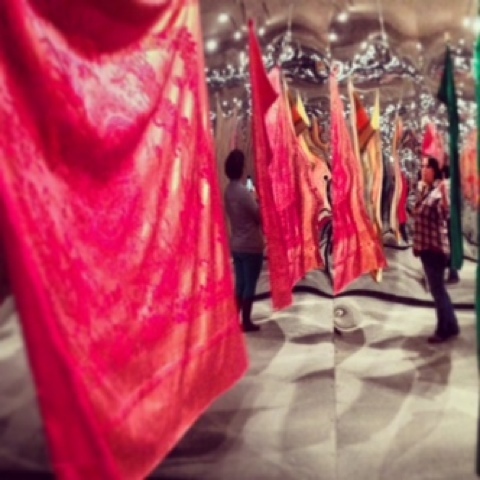 What amazing gallery exhibits have you gone to lately? My mom and I went to this lovely new nursery this weekend named Russell Nursery. I love nurseries and always walk out with way more than I should. This nursery was right in the middle of tall pine trees and it smelled like the west coast and green air and just lovely. The nursery had an open air feel but the roof was made of thick corrugated plastic. About half way thru our visit it started to rain and the sound was amazing. I could have stood there for a long time. On one of the benches amidst some ferns there was a sign that said 'birds nest'. 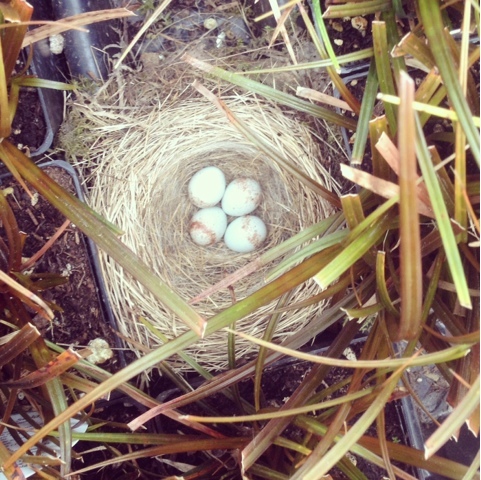 For a second I thought that the plant was named 'birds nest' but then we heard a flutter and realized there was a real birds nest with four gorgeous pale blue eggs with brown stripes. What a surprise! I was super enchanted about it. I bought some lovely succulent hens and chicks and black mondo grass. 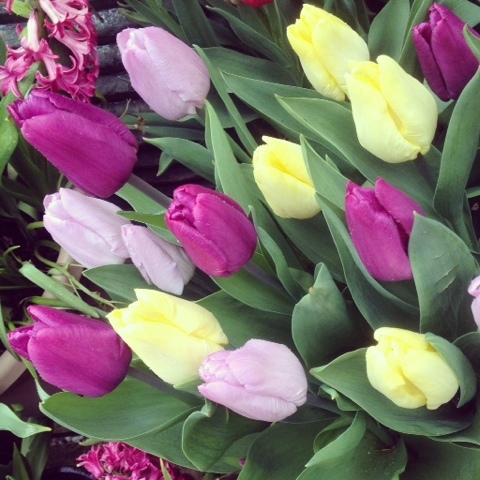 The potted tulips called my name but I resisted and only snapped a quick photo. 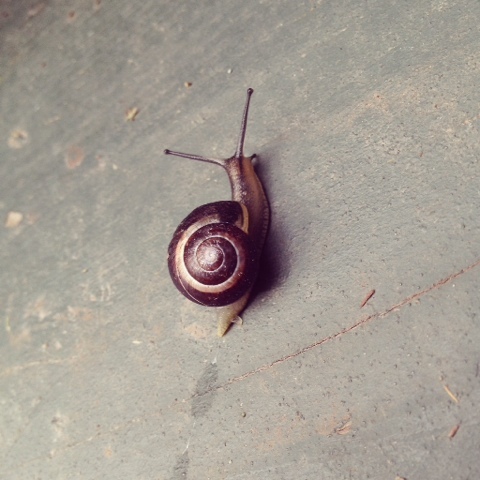 I replanted the hens and chicks Sunday morning and found this lovely little snail friend. My cat also wanted to be friends with this snail of course. I can't wait to go back to Russell Nursery. Next time I'm definitely going to buy some more succulents. 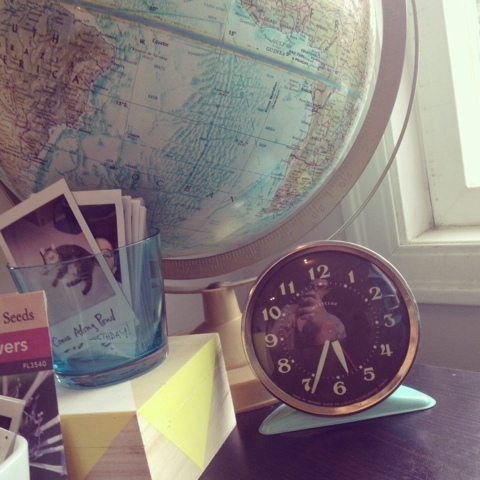 What are your favorite things to buy in a nursery? I've been without Internet for a week. Definitely #firstworldproblem but really, anyone who's been there understands both the frustration and the rising phone data numbers. Still-it's a beautiful day today and I have internet once again. Bring it on world! Have I posted this picture before? No idea. 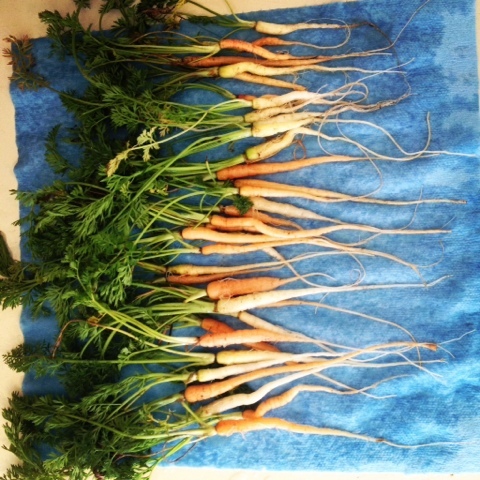 I could write an entire blog post on what planting carrots has taught me. 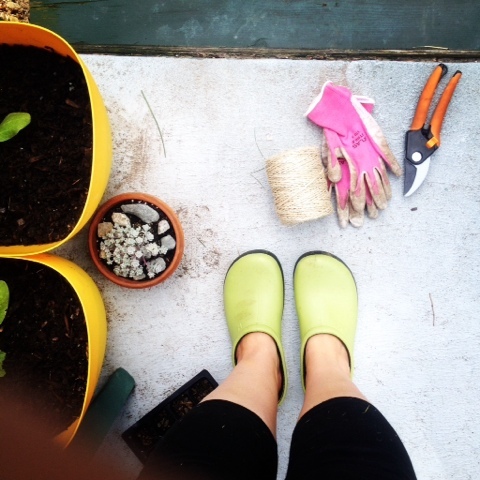 First and foremost that patience is required in all gardening. And then, I need to learn to thin the seedlings. This is hard-who wants to pull up baby carrots and tell them there's no room for them? Not me, that's for sure. Crystal mentioned the photo shoot we're doing this weekend. This is the Pirates flag. It's going to wave in the wind so beautifully! We literally decided that the pirates should have a flag and walked into the closet/studio and pulled out this fabric, tied it on and *presto* it was gorgeous. Magic really! My best friend visited this weekend. We went out for dinner on Saturday and had the worst service ever. Ugh hate that. The food was amazing tho which always leaves me questioning leaving a tip. 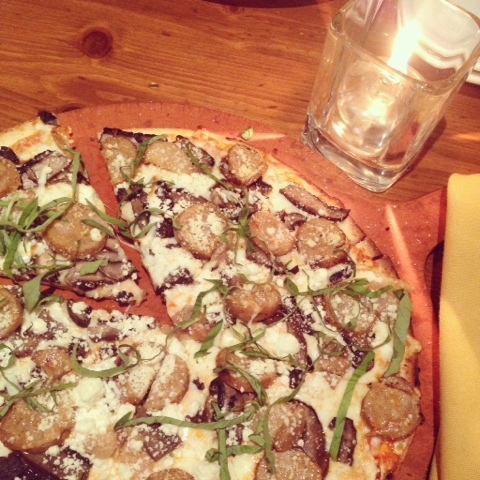 This pizza had sausage, mushrooms, feta and caramalized onions on it. Divine! 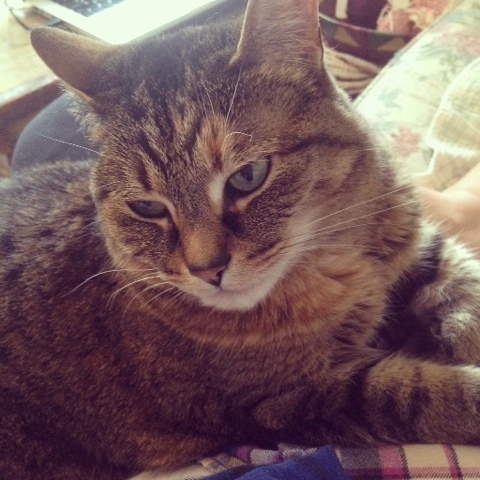 This is when I told me cat we had to go to the get so she could have her second shot of anti biotics for the uti that won't quit. Fingers crossed it's all good this time. The weather has been delightful lately. Spring has sprung and this girl is happy. Enjoy your Wednesday! Lastly, just finished this last night and thought I'd share. It's a Sri Lankan elephant in mixed media (pencil, charcoal, watercolor, acrylic) on 18x24" paper. These are endangered animals, but the government protects them by having the punishment for killing one being the death penalty. I love trail mix. The best part is deciding what to put in. Sure you can buy a ready made mix, but why not mix and match all your favorite items? 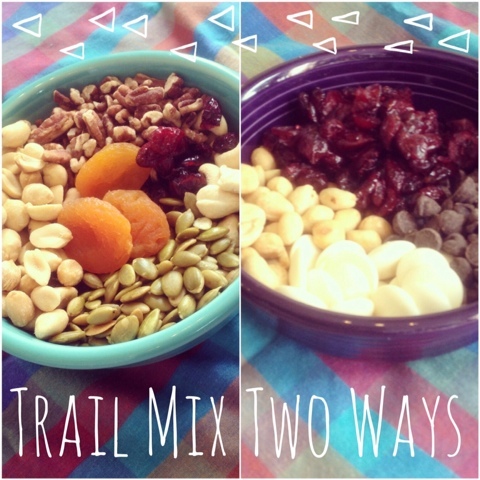 Here's two ways I like to enjoy trail mixes. 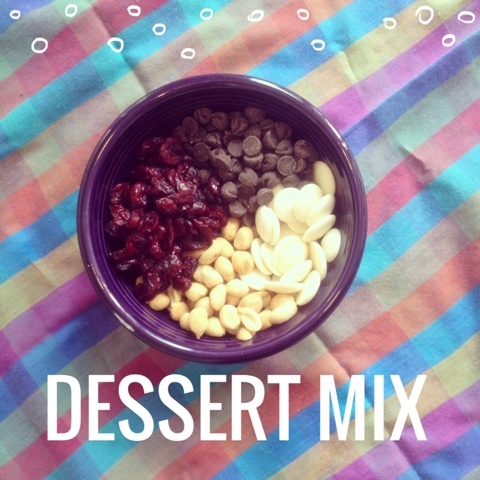 The Dessert Mix is a nice treat for afternoons. Sometimes I love a little bit of sweet something mid afternoon so a small bag of this hits the spot. It's fairly simple and doesn't have a lot of ingredients. I put in peanut butter chocolate chips the other week and it was delicious. The right combo of sweet and salty! 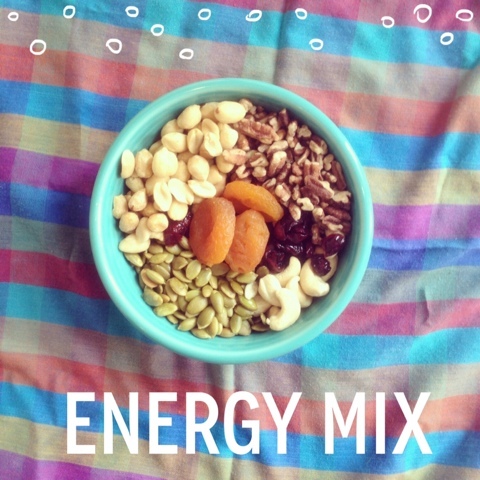 The Energy Mix is wonderful for a pick me up if you're between meals or on the go. It's great for hikes or even to keep a small amount in your bag. 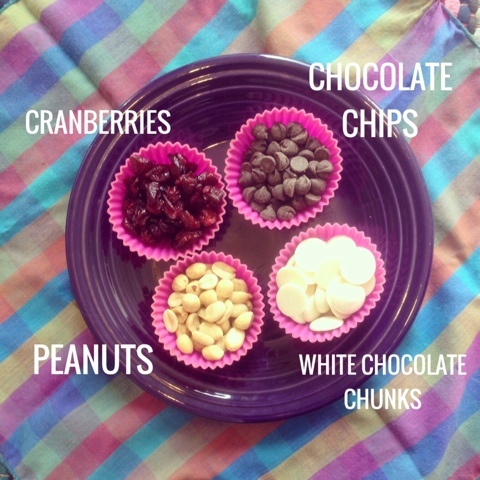 Mix and match your favorite dried fruit for this one! Love the raw nuts mixed with the dried fruit. Delicious. Who doesn't want to eat a bit of this? 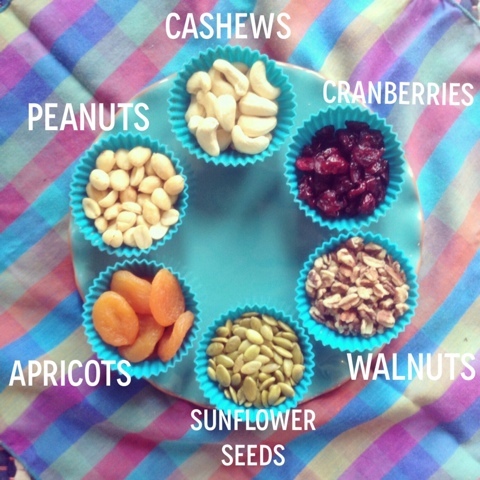 What's your favorite thing to put in a trail mix? I am enamoured by plants in glass jars, especially succulents. There's something about the light shining through the glass, and being able to see all the soil and rocks. 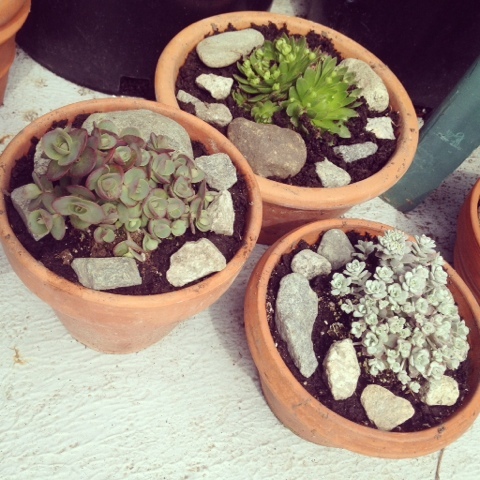 Today I'm posting a DIY so that you can share in these beautiful planters. You need soil, jars and rocks...oh and a plant of course! Any small plant will generally work, except cacti which can't abide the humidity. Do a layer of rocks at the bottom of the jar, for drainage. Then the soil and plant. Because these are succulents (which don't like to get wet) I added a layer of rocks just below the leaf level. Not only does it help with the plant's health, but it also cleans up the top layer and makes it look nicer. Succulents don't like their leaves to be wet, or they rot, so make sure that the jar is big enough that the plant isn't touching the sides. This way condensation won't hurt your plant. You can keep the lid on sometimes, but make sure to take it off sometimes too to air the plant out. Place it in indirect sunlight, because of the glass direct sunlight will be amplified and you may end up frying your plant! Sunlight is good, but not for more than an hour or two a day. 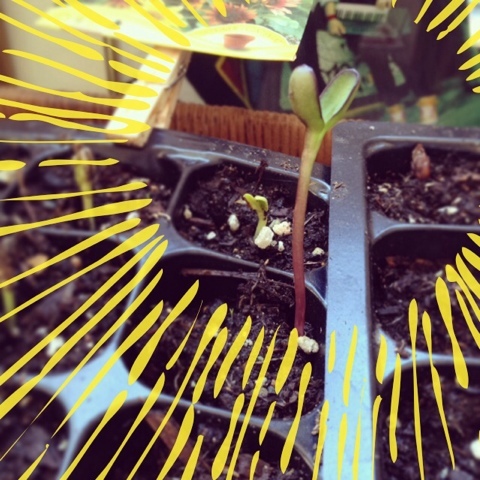 The best thing that ever happened this last week was looking at where I'd planted my sunflower seeds and seeing that they were sprouting. What?! So far I have ten out of twelve growing. And growing fast too! Who knew? I bought some lovely yellow pots to put my seedlings in once they've grown a bit more. And hopefully I'll have some to give away to family and friends! What good is it to grow plants if you can't share? 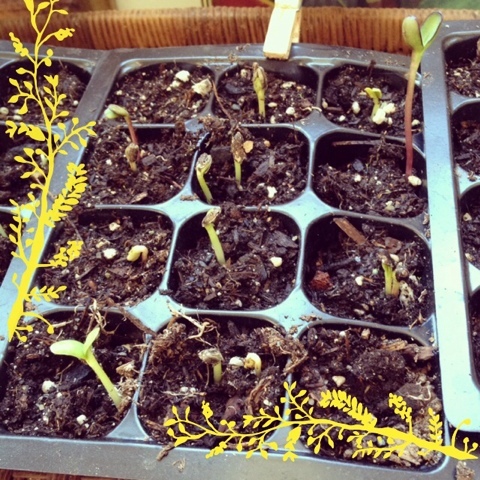 The best thing ever is watching plants grow from a little seed. It's such a miracle! Anyone else feel this way? DIY - Altered art & collage swap books! - You can make it beautiful! 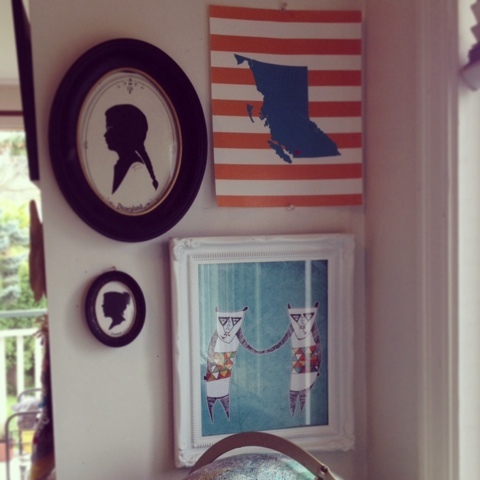 Holly and I both love collage and old books, so we love the idea of our altered art swap books! Basically we have two, which we add to and then swap back and forth, so each of us always has one. We've come up with some pretty awesome page spreads (see below for a few of them!) And I've created a blog that is just for photos of these books here called Yellow Hammer. To keep them looking interesting and because of the cool yellow aged paper, we use small old books we pick up at second hand stores. Basically anything goes. Pens, paint, acrylic, watercolor, cut-outs, stickers, decals etc. Whatever can fit inside the book is fair game. I have a giant wire basket I toss anything that looks interesting into and that's my pile of creative ideas. Use lots of glue so they don't fall out later, and staples are another favorite adhesive. Below you can see a few of the pages we've done. As you can see we use a variety of styles and ideas. Whatever happens to sound good at the time. We each do one or two pages before passing it on, and they can be singles or two-page spreads. Become a sponsor for our blog, look here!